If you haven’t had chance to explore the Queen Elizabeth Olympic Park since it was re-designed for public use after the Olympics, it’s well worth a visit. 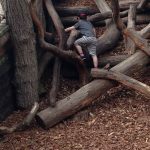 Quite apart from the views from the Orbit and the activities on offer at each of the aquatics centre, velodrome, Copper Box, Hockey/Tennis Centre and Olympic stadium, the park has plenty to entertain little ones for a few hours. 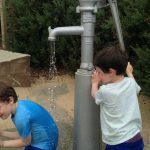 Starting at Westfield Shopping Centre or Stratford station, head into the park and look out for the 195 water jets in the Waterworks Fountain outside the Olympic Stadium – perfect for splashing about on a hot day. 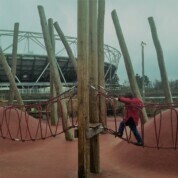 Walking away from the Stadium to the north, you’ll find the Pleasure Gardens play area with climbing wall, red rocks to scramble on, rope bridges, giant swings and a sandpit. 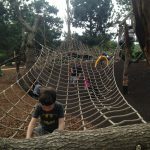 A further ten minute walk to the north of the park (perfect for scooting or bike riding) leads to the Tumbling Bay playground where you can climb trees, navigate rope bridges, slide and swing to your heart’s content before heading to the sand and water area to get really messy. My boys can easily pass a couple of hours here pumping water and using the pulleys in the sand pit (take spare clothes!). There’s lots of seating for adults to relax while the little ones play, and the Timber Lodge café is at hand for snacks, refreshments and loos. If you are heading back to Stratford station from Tumbling Bay I’d recommend walking down Olympic Park Avenue rather than taking the longer (approx. 25 minute walk) through the centre of the park. This drops you straight back at Westfield where you can also explore the fantastically imaginative Biodiversity Playground found between Stratford International Station and the Great Eastern Market, before heading home. Go up the ArcelorMittal Orbit for a great view of London. Tickets cost £11.50 (adults), £5.50 (children), under 3s free. If you also want to ride the world’s highest and longest tunnel slide down from the top of the Orbit (suitable for over 8s) tickets cost £16.50 (adult), £10.50 (child).